Plan, prepare, and practice to punch the tag of a lifetime. When hunters fresh to the West go home empty-handed, it’s usually for one of two reasons. They can’t get to the game, or for those who can, they fail to get in position and make the shot before the opportunity walks away. Nine years of professional guiding in Montana and Utah taught me that. And every guide I’ve discussed the matter with agrees. While these issues are all-too-common, you don’t have to be that hunter who goes home with nothing but wistful tales of the one that got away. Here’s how to anticipate, prepare, and perform when the time comes. The physical aspect of hunting the West’s Rocky Mountains is vastly different from hunting, anywhere else in the Lower 48. Yawning canyons, knife-edged ridges, and windswept plains give up their shot opportunities reluctantly. You can expect to put in a considerable physical effort to find game and then more, usually in a race against time, to get within range. Your level of physical fitness will determine where and how hard you can hunt. Be realistic, but be determined, too. Exercise frequently for several months before your hunt and emphasize building mental toughness. A no-quit attitude is more critical than even physical capability. While working on physical fitness and mental fortitude, practice visualizing shot opportunities in rugged, dangerous, wild country far from any treestand, ground blind, or shooting bench. Expect a big, mature animal to be in the hardest-to-access spot in the country. You may be exhausted from hours of hiking, but if you or your guide spots a big critter, you’ve got to switch on the reserve tank, put the motor in high gear, and get yourself close enough for a shot. That may require running a mile down a ridgetop or climbing a half-mile straight up through a treacherous, loose-shale rockslide. You may have to cross through a cavernously deep canyon and climb out the other side. Sometimes the effort for success is so shocking that hunters quit, often when just a little more lung-heaving, muscle-burning toil would have put them inside ethical range. Those folks never return to the West. Those that dig deep and get it done reap rewards that are deeply fulfilling, and they become addicted. Just remember: If you aren’t willing to gut it out to get to a spot from which to shoot, you’ll never have even a chance at success. The West calls, challenges, tests, and rewards those that meet her halfway. Expect it. Relish it. Earn it. 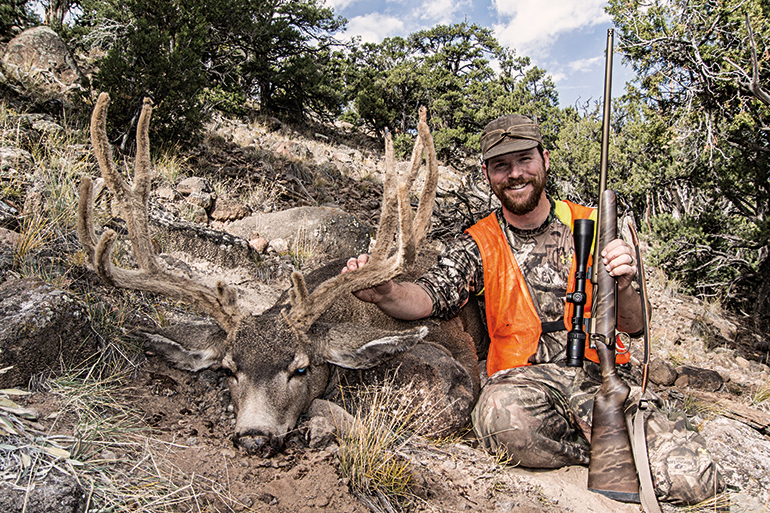 Once you’re within your ethical range and found a shot window, you must have the mental wherewithal and technical savvy to put together a stable position and send a bullet through the vitals of that big buck, bull, bear, or ram—usually with very limited time. 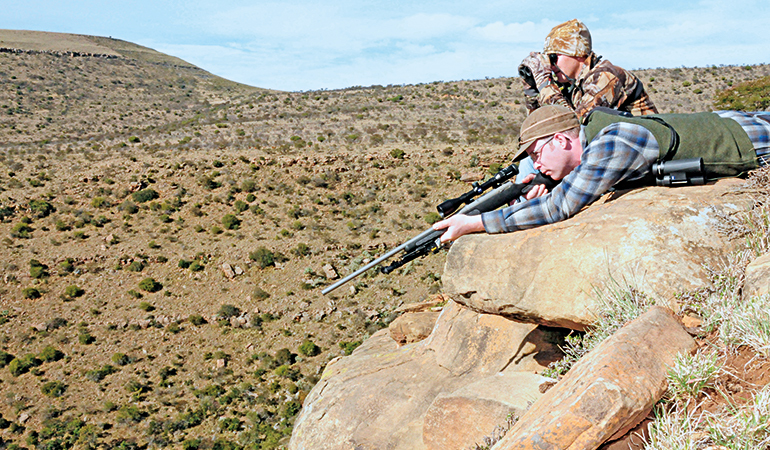 Here’s where most non-mountain hunters come apart at the seams. First, they can’t see the game. Then, they can’t get quickly into a steady position. Finally, they don’t know where to hold past 100 yards. The fact that many big western animals are shot at distances 300 yards or farther exacerbates the issue. To prevent the first problem, practice looking. When your guide finds animals, ask him to point them out and take the time to study them, even if they’re females or small bucks. Learn how they move, learn their colors, and learn their shapes. Don’t fall into the habit of being a lazy client by letting the guide do all the glassing. Try to find animals before the guide. All this will help you key in on a shooter when it appears. Next problem. Field positions are tricky for non-westerners. After all, who wants to lie prone among the chiggers back home and practice shooting? Or learn to dive into position like a baseball player going for home? Practice shooting paper plates offhand out to 60 yards or so. Past that distance, most hunters—no matter the running whitetail that they bumped off with a 200-yard snapshot back in high school—just can’t reliably make an offhand shot. Try for speed, with the caveat that you never fire unless you know the shot’s money. Don’t press the trigger on a high-risk shot; you’ll just spook the game out of the country. If you’re wobbling all over, get steady and then kill cleanly. This mule deer buck was shot from a considerable distance using an improvised position on a steep slope seconds after being spotted. The deer was about to crest the mesa top. Learn to drop quickly into a sitting position, elbows planted firmly on knees, and smack that paper plate out to 200 yards. Sitting is the most stable, most useful position for fleeting shot opportunities inside that distance. Perfect the art of going prone fast and squeezing a careful shot into that paper plate out to 300 yards—in less than seven seconds from a standing start. Then add a daypack or bipod and extend that distance to 400 yards. Learn to glance around and use natural terrain features when setting up to take the shot. A big rock, log, or hummock can serve as an improvised benchrest and significantly improve your chances of making a perfect shot. Once steady, take a deep breath or two, oxygenating muscles and sharpening vision. Lock the crosshairs in position and squeeze that trigger. Follow through as the rifle recoils. Then, while keeping the scope on the animal, work the bolt like there’s no tomorrow and get the reticle back on the vitals, ready to shoot again if necessary. When hunting rugged, high-elevation country, the old adage KISS (keep it simple, stupid) applies. You don’t need a daypack full of whiz-bang gadgets; you just need to be really good with your rifle. Know your precise point of impact to 400 yards. Use a clear scope that allows you to see your game in challenging low-light conditions. Use a premium bullet that will drive deep and kill effectively from any shot angle. Finally, be aggressive. 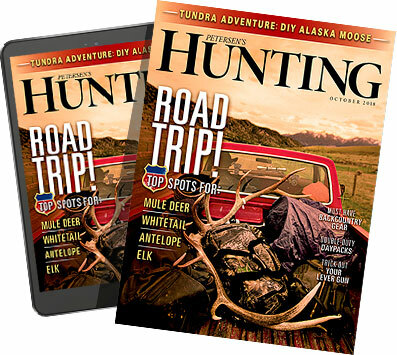 Unlike the whitetail woods, where a big buck is often better left unpursued and unspooked in hopes of getting a better opportunity another day, game in the West is unpredictable. Once that big trophy is found, give everything you’ve got to take it, because you’ll probably never see it again.